THIS PROJECT TALKS ABOUT REBUILDING AND REDESIGNING OF THE INFORMATION ARCHITECTURE OF NATIONAL UNIVERSITY OF SINGAPORE, BUSINESS SCHOOL THROUGH RESEARCH AND SEVERAL USER TESTING. 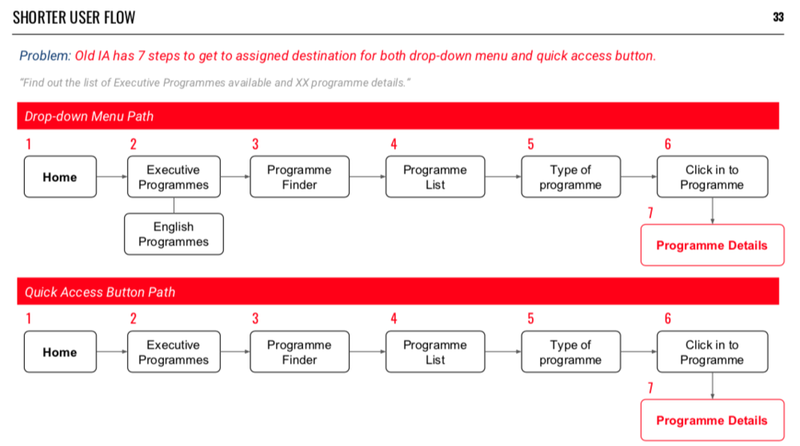 In a group of 2-3, redesign the Information Architecture (IA) and key pages layout/wireframes of a school website. 3 user personas are provided, and students are free to adjust and update according to local context. The client’s brief was created by the teaching assistants in General Assembly to imitate a real-life experience. The content and creator of this article is not affiliated with the organisation mentioned. Content audit, User interviews, Competitive analysis, Card sorting, Tree testing, Usability testing. Axure RP, Post-its, Optimal Workshop, Excel Sheets. For over 50 years, NUS Business School has offered a rigorous, relevant and rewarding business education to outstanding men and women from across the world. The School remains distinctive among the world's leading business Schools by offering the best of global knowledge with deep Asian insights, preparing students to lead Asian businesses to the forefront of the world economy and to help global businesses succeed in Asia. As part of the National University of Singapore, a top globally ranked university, NUS Business School shares the University’s global reputation for academic excellence in education, research and service. 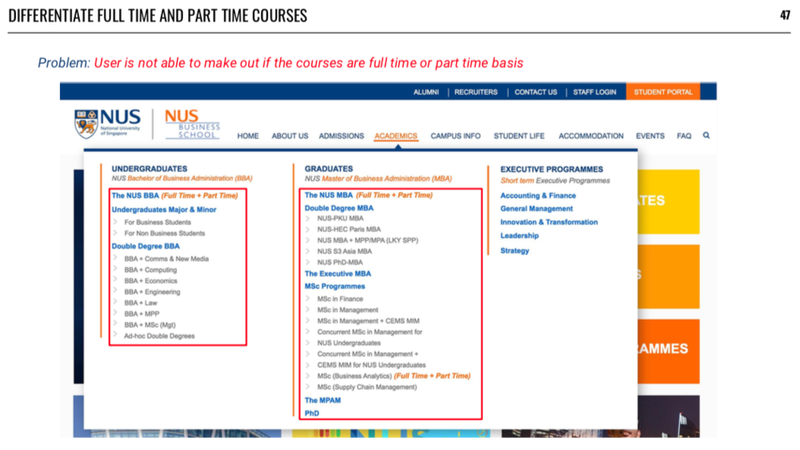 Read about NUS Business School here. Click here to view high-res IA. To unify the website with a well-designed information architecture instead of having numerous micro-sites. Redesigning layout and visual hierarchy and introducing consistent modular. Information should be easy to digest and locate. A website that is easy to use for both first-time user and repeated user. We want to redesign the website without jeopardising the business interest of NUS Business School. We conducted a heuristic evaluation on 6 schools (design, arts and business) and analysed the good and the bad. We looked at their layout, drop down menus, content distribution and interface design in both their home page and detail pages. Click here to view the complete heuristic evaluation. 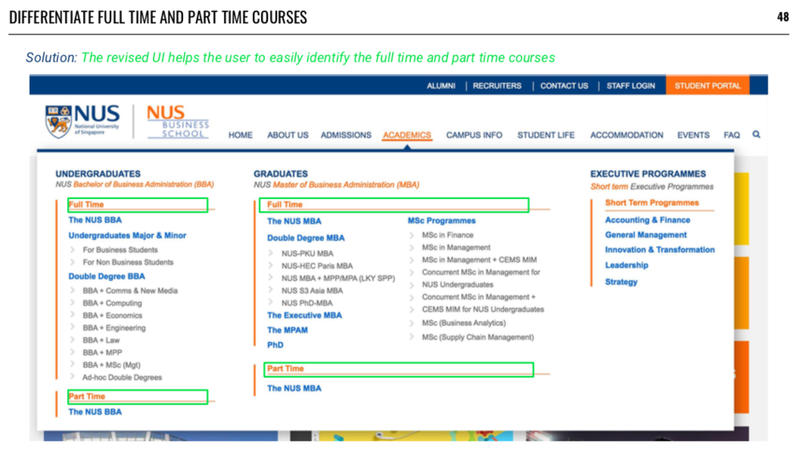 As NUS Business School is a very traditional and formal institution with rich heritage, huge student body and several partnerships — the website should not go through a drastic change in its user interface design. We decided to design the website as closely to the original site as possible and improve the UI by decluttering, reshuffling information and improving its content and visual hierarchy. We counterchecked our draft IA with the Dendrograms to prove that our grouping was correct. It eliminated a handful of labels and saved us a huge amount of time. The Similarity Matrix is then used to pair labels that were grouped together by users and added in to our list of correct groupings. The labels that are not confirmed at this stage have to be crossed reference between draft IA, Dendrogram and Similarity Matrix. Labels that are not define based card sorting analysis have to be tested using the Treejack testing. Successful rate range from 50% to 80%. We were able to determine most of the labels where they should belong. The proposed IA is still a massive map. The main changes we did was reshuffling and regrouping content so that users can have the information they need at one go by removing or pushing labels a level up or down. Categories now have a higher clarity and better grouping. Click here to view our interactive prototype. A huge part of this is completed by my partner Janus Tan, while I contribute by giving feedbacks and areas of improvements. Thanks for pulling all-nighters on this! We conducted a task-based usability testing on 5 users aged between 20 to 29. 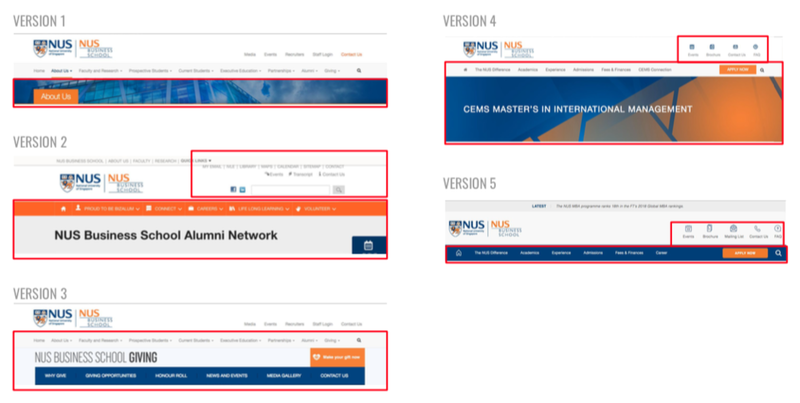 User feedbacks on original website VS redesigned website: Redesigned website is “better”, “clearer”, “easier to navigate”, “homepage is less clutter” than original NUS website. I build experiences and interfaces that balance what your users need with what you want.